Confession time. I love spinach, but whenever I eat it (except for my smoothies) I always pull off the stems. Come to think of it, I don’t eat broccoli stems either…how weird is that? Stems or no stems this salad is REALLY good and is perfect as a quick lunch or dinner, especially if you’re trying to get back on the health track. The creamy citrus honey dressing gives it a burst of tang and sweetness, helping to brighten the overall flavor, you get a savory punch with the onion and mushrooms while the egg adds some protein. 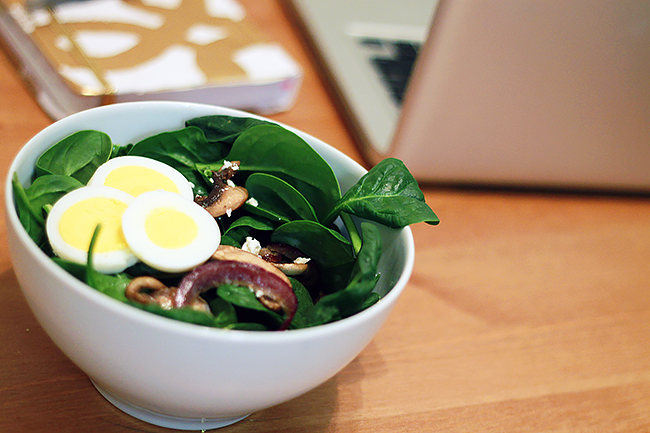 If you’re sick of the same ol’ boring salads, you’ll definitely want to try this one! Heat olive oil in pan over medium heat and add onions. Cook for several minutes and then add the sliced mushrooms and continue to sautée. Remove from heat and set aside. Meanwhile, combine the orange juice, honey, garlic, olive oil, salt and pepper in a mason jar and shake to mix. Add in the Greek yogurt and continue to shake until thoroughly mixed; taste and adjust seasoning as needed. 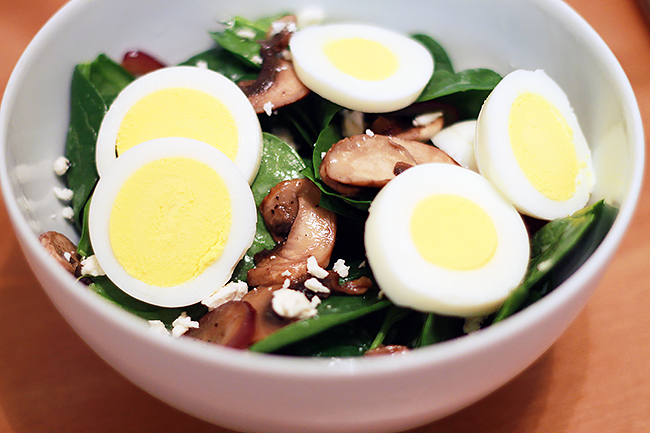 Place spinach in a bowl and top with a few drizzles of dressing, the onions and mushrooms, feta cheese and sliced egg. Dig in!